Vocabularinist - "Hasznasznisznasz" / "Vorsichtsmassnahmen"
What's a Vocabularinist? Hell if I know. But the image at their web site implies it has something to do with traveling through someone's digestive tract. Ummmm... yummy. What I can tell you is Vocabularinist is an Australian outfit that plays some creatively insane music that I'll attempt to describe in a moment. The band has had up to 8 members and instrumentation includes guitars, bass, drums, keyboards, synths, violin, saxophone, tapes, turntables, and probably much more. 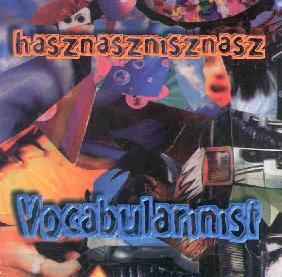 Hasznasznisznasz is Vocabularinist's first CD, though the band has had several earlier cassette releases. Analogies for the music are difficult but some that are appropriate for Aural Innovations readers would be Vas Deferens Organization, Faust, and maybe the Residents. Vocabularinist can be spacey at times but are usually more punked out and even metallic than the mentioned comparisons. The band make full use of the studio for zany collages and fun efx. I also noticed on their web site that they play live quite a bit and listening to this CD I wonder how it might translate to a live situation. The band can be many things at once with the music smoothly gloming together numerous seemingly unrelated styles. Things get downright nuts on tracks like "When You Oscillate For Money" and "Ballad Of Multiple Phobias" in which freaky space synth noodlings combine with strumming acoustic guitars and rather disturbed vocals. The former blends into the Ballad which is a crazed guitar and sax freakout backed by more spacey synths and mad vocals and lyrics. But then they take a 360 degree turn on "You Blow My Cover" shifting from the craziness to a Dubby drum 'n bass ambient piece. But these shifts are par for the entire course of the disc, the whole of which is an intense, but often whacky, roller coaster ride. One of my favorite tracks is "Of All The Faces", a space punkin' rocker with nutso vocals and a generally intense party atmosphere. In fact, I think I'll stick with my Vas Deferens Organization comparison. Vocabularinist don't necessarily sound like VDO, but if you imagine a rollicking punked out version of them then you'll have something a bit like the Vocabs. Overall, there's plenty of spaciness and freaked out guitars but the Vocabs are definitely in a world of their own. Well produced and not just crazy for the sake of being weird. 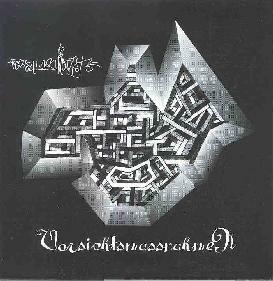 The latest release, Vorsichtsmassnahmen, is a compilation of improvisations from various Vocabularinist members either solo or in some combination of smaller parts of the band. It's not clear who is performing on which tracks but the lineup consists of Bumscuzz, Feelbo, Listamint, Dodja, Farnzchmitt, E. Oppenheimer, N.A.R.C.P., and Grover. The music on Vorsichtsmassnahmen is a bit different than Hasznasznisznasz. The quirky humorous atmosphere is still in evidence but the electronica is far more predominant and the guitar parts, when heard, are more lo-fi. Still, despite the lo-fi nature of the tracks there's some interesting music here and my Residents comparison on Hasznasznisznasz is far more apparent. I hear lots of tracks that remind me of moments from Eskimo and Mark of The Mole. But there are some cool electro dance-oriented tunes as well. Even the seemingly simple tunes have a lot happening including several contrasting synth themes and the oddball vocal styles that I gather are typical for Vocabularinist. And the spacier tracks like "The Message Is: Freedom" still recall VDO for music that is totally freaky while including influences (intentional or not) of the early 70's German electronic space pioneers. And then there are the more Hawkwind-ish moments like "Emergency Pisstop", and jamming psychedelic tunes like "Gypsy Reprise". In short, this is as varied as Hasznasznisznasz and just as much fun, though Hasznasznisznasz was the one that really excited me and the one I would recommend as the place to start with Vocabularinist, though the adventurous would do well to check out both discs as the creative level is equally high on both. Vorsichtsmassnahmen has a higher pure space factor, but I think I just liked the frenzied energy and aggression of Hasznasznisznasz. You can visit Vocabularinist at their web site. Listen to samples of Vocabularinist music at their Mp3.com web site. Contact via snail mail c/o Subversive Records; PO Box 341; Fivedock; NSW. 2046; Australia.